Last week was my father-in-law’s 77th birthday and he invited some of his friends (read senior citizens) for a party at home. Keeping in mind everyone’s age and preferences, I kept the menu very simple and everyday food. There was Poha, sambhar-vada, dhokla, chutney, sev and hot tea. His friends got him a cake from a bakery and I made him another simple but rich in taste which will specially appeal to elderly, Cashew Cake. I followed my basic cake recipe which I have conquered for tea cakes. I replaced some flour with cashew flour or meal. The more you replace, the dense cake can be. I recommend somewhere between 1/4 cup to max 1/2 cup of flour replacement. Apart from richness, addition of cashew flour gives better taste and a softness which cannot come with essence. The taste is simple yet something like an Indian sweet. A very suitable cake to please elders, in-laws or people looking for different flavours. This cake lies somewhere near a Mawa Cake. 1. Preheat oven to 200 C. Grease and line a 6 inch round pan. Sift flour 2-3 times. After toasting almonds in the oven, gently split them into 2 or you can use whole almonds also. 2. In a large bowl, beat the sugar and yogurt for 5 minutes on high speed. Add baking powder and baking soda, beat in on low, and allow to stand for 3 minutes. You will find that bubbles appear. Beat in the oil and vanilla extract to the curd mixture. Slowly add the flour in 2 lots, blending in well after each addition. Fold in cashew meal now gently. 3. Pour the batter in the prepared pan. 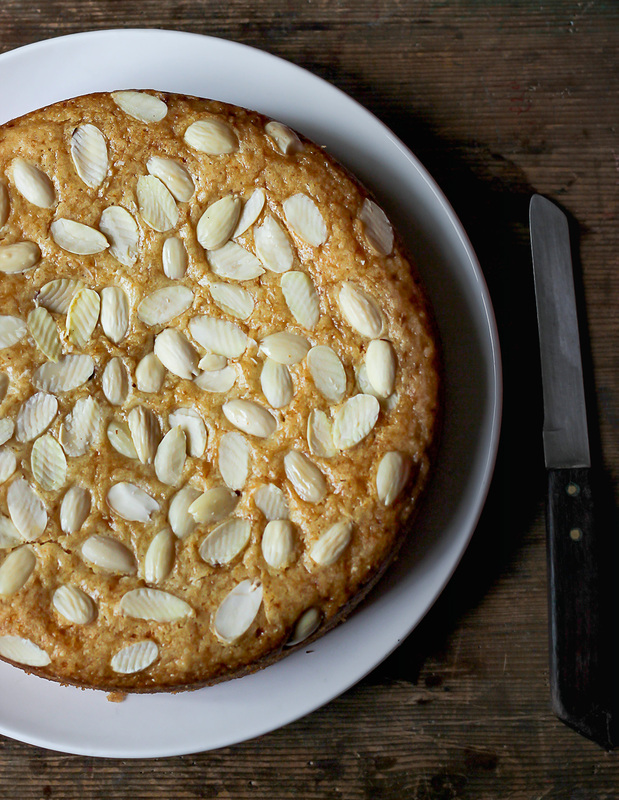 Top with toasted almond slices. Bake at 200°C for 10 minutes, reduce temperature to 170-180°C and bake for 25-30 minutes or till a toothpick inserted into the cake comes out clean. Heaped 1/4 cup of whole cashews will give approximately 1/2 cup of cashew flour.